Obituary – Lavington, Rose Maude « Perry High School Alumni Association, Inc.
Rose Lavington, 73, a native of Perry who lived at 810 Delaware street, died at 4:15 a.m. Saturday at Perry Mem­orial hospital where she had been a patient since Feb. 5. Arrangements for services were pending Saturday at, Parker Funeral home. Miss Lavington was born in Perry Sept. 25, 1907. She grad­uated from Perry high school in 1925. She later left Perry to live in Oklahoma City and returned in 1951. A member of the First United Methodist church, she had worked as an office clerk. She was a past president of the Perry Business and Profes­sional Women’s club that is now the Perry Business Women’s club. 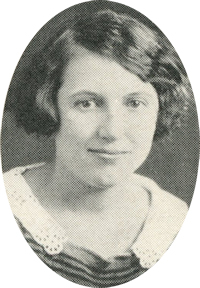 Miss Lavington for many years was active in the Noble county Democrat Women’s club and active in Democrat party affairs. Survivors include two sisters, Mrs. W. G. (Florence) Foster, Perry, and Amelia Lavington, Perry; and three nieces, Sylvia Perkins, Tonkawa; Phyllis Price, Del City; and Maxine Moss, Shreveport, La.